The Bladez XTR SE 450 and 500 are virtually identical so the same conversion controller will work with either model. The most popular controller that we sell for replacing original 24 Volt 500 Watt controllers is our item # SPD-24500B. This is the controller that I recommend for the conversion. To make things easy I would replace the controller with the SPD-24500B and the throttle with a THR-35 or any other standard 3-wire throttle that we sell, this way you know that the new controller and throttle are compatible with each other. Controllers are too complex to easily test, so testing the parts that are connected to the controller is the best way to determine if it is working or not. I would start with testing the batteries. They should be tested for proper Voltage both without a load and with a load. The motor can be wired directly to a battery to make sure that it works. The power switch and circuit breaker or fuse can be tested for continuity with a multimeter to make sure they work. The throttle can also be tested, if it is a two wire throttle then it can be tested for continuity, and if it is a three wire throttle then it can be tested using our Throttle Testing Guide. I was looking at the wiring of the SPD-24500B I would imagine that it would work on my XTR-Transporter would it not? I would have to get the mating pin connectors to match the exiting wires , but what about the key switch connector, my Transporter does not have that option. What would I do with it? I would also need to change the throttle from a two wire micro switch to a three wire. We do not have a Bladez XTR Transporter electric scooter in the shop right now so I am not able to test fit a SPD-24500B controller into one to see if it will fit. However I do know the dimensions of the SPD-24500B controller and they are 3-1/4" x 2-9/16" x 1-1/2". Using these dimensions you should be able to determine if it will fit or not. I am fairly certain that we have sold SPD-24500B controllers for Bladez XTR scooters before and that they do fit. The SPD-24500B controller will work with any type of on/off power switch, it does not have to be a key switch. The Bladez XTR Transporter's original on/off rocker switch will work with the SPD-24500B controller. Any of our standard 3-wire throttles such as our THR-35 will work with the SPD-24500B controller, and also any of our 4-wire throttles with battery level indicator lights such as our THR-46 will work with it also. Thanks you very much for the answer. I have made the purchase of the SPD-24500B. I had a look at the throttle and I prefer the lever throttle already on the scooter and after checking I saw it was already a three wire throttle, my only question is, can I ruin the controller if I make a mistake on the throttle wire set-up ? If yes , do you have a lever throttle compatible with the controller ? Electric scooter controllers are sensitive to the miswiring of any parts that are connected to them and can be ruined by a mistake with the throttle wiring or throttle type. We do not carry any finger pull lever throttles becuase they have been replaced by twist and thumb throttles on all modern electric scooters. As far as I know finger pull throttles are not being made anymore. The original Bladez XTR 3-wire throttle that you have is most likely compatible with our controllers however it would need to be tested to know with certainty if it is compatible. If the throttle was sent to us we would be glad to test it for compatibility with our controllers, or you could test it yourself using the guide below. The signal wire may be green, blue, or white on some throttles. I have seen 3-wire Bladez XTR throttles with green and white signal wires. The red wire will always be +5 Volt input, the black wire will always be ground or negative, and the remaining third wire will always be the output signal wire. If during this test the throttle has around a 0.8 through 4.2 Volt output signal depending on the position of the throttle then it is compatible with our controllers. The throttle should be around 0.8 Volts at zero throttle and around 4.2 Volts at full throttle. 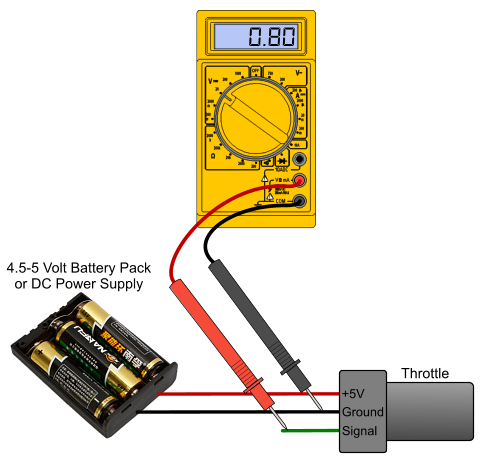 The controller reacts between 1-4 Volts so anything within this Voltage range is acceptable. That is exactly what I needed to know, you guys are awesome !!!! Thanks again for the help. Merci Beaucoup!! Damn-it!!! Just checked the throttle and as per your testing procedure, I get 0 to 2.3 volt span instead of .8 to 4.5. If my controller hasn't left yet, I would add a throttle to the order. So the THR-38 will work just fine with my SPD-24500B ? Your order has not shipped yet so I have placed it on hold and asked one of our customer support agents to give you a call to take the new order for a THR-38 throttle. You should be getting a call from us within a few minutes. Normand Doucet, I'm working on almost the same thing. Could you post some pictures. Merçi beaucoup aussi.